My copy: From the author as part of a giveaway, thanks! The Wild Girl is a story of the Brothers Grimm and how their book of fairy tales came to be written. It is also a story of two families, growing up in Hessen-Cassel (now central Germany) in the early nineteenth century, just as Napoléon is starting his conquest to bring all of Europe into his empire. It is sometimes heartbreaking and even disturbing at times, but over all, it is one of the most beautiful, gentle love stories I’ve read in a long time. Dortchen Wild lives with her five sisters and her parents above her father’s apothecary shop in Cassel. Dortchen’s best friend, Lotte Grimm, lives next door, but when Lotte’s brothers Wilhelm and Jakob return home from their studies in Marburg and Paris, the twelve year old Dortchen falls in love with Wilhelm. In November 1806, Napoléon’s armies marched through and occupied Cassel, freeing the serfs and bringing other freedoms, but putting terrible pressure on the economy of the city. Unable to find work under the new regime, Wilhelm begins to collect folk stories to preserve them. His brother Jakob supports his whole family on his meagre librarian’s wage. Many people (myself included) think that the Grimm fairytales were told to the brothers by various people all over the country, or written by the brothers themselves. In fact, many of them were told to Wilhelm Grimm by the young Dortchen Wild, of whom very little is written. Others of the stories were told to Wilhelm and Jakob by other well-to-do young ladies of their acquaintance, and in the well-researched The Wild Girl we are introduced to those ladies and to the original, less child-friendly versions of some of the most popular fairy tales of the present day, including Cinderella (Aschenputtel), Hansel and Gretel, Sleeping Beauty, Rumpelstiltskin, and many more. The Wild Girl not only tells the story of the creation of the fairytale collection of the Brothers Grimm, it is also a beautiful love story between Dortchen and Wilhelm, heartbreaking at times but very sweet at others. The tale of the people of Cassel and their suffering at the hands of the French armies is not an overwhelming part of the story but there is just enough historical context to frame the other events of the story. Kate’s telling of dark and dramatic events is interspersed with light-hearted moments which made reading this book an absolute delight. It wasn’t only the research into historical events that interested me about this story, but also the extensive herb lore Dortchen and her father use as part of their apothecary work. The garden of medicinal plants just fascinated me, much like the herbology also discussed in Bitter Greens! The real highlight of this story is the characters themselves. Kate Forsyth does such a wonderful job of bringing characters to life that I felt I was sharing their joy, terror or anger. Herr Wild, Dortchen’s father, is such a creepy and at times terrifying man in this story, but at the same time we see his despair at his country being trodden down by the French and his kindnesses to those less fortunate families in the town. Dortchen herself starts out as such a carefree and happy girl, but the hardships throughout her adolescence make her into a much more subdued young lady – something that I’m sure has happened to many women throughout history. That doesn’t stop her from being a selfless and kind person, always putting others well-being before her own, sometimes putting herself in harm’s way instead. 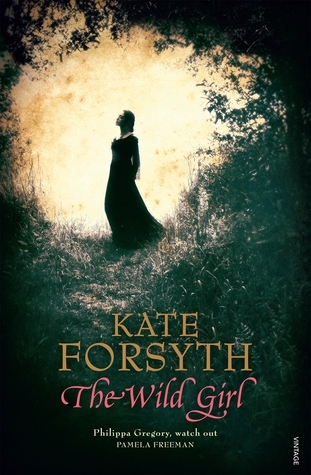 The Wild Girl is not just for historical and romantic fiction readers – those who love fairy tales will also find plenty to fascinate them here. It’s certainly one of my favourite reads so far this year! What did others think of The Wild Girl? I am reading this at the moment and thoroughly enjoying it! A great review Angelya! I too loved this novel! I LOVE the Brothers Grimm! And I love the idea behind this story. AND that cover is absolutely stunning. I will definitely have to put this one on the TBR!